With its sizeable collection of high-altitude resorts, 8000km of pistes spread over 300 ski resorts France has justifiable claims to be the doyenne of the European ski scene. While Austria has better night-life, Switzerland more chocolate box charm and Italy the greatest mountain restaurants, none can rival France's ski resorts strength in depth. The French fell out of love with skibikes in the 1970s, following a series of accidents blamed on the crude early designs and hooligan behaviour. A ban was introduced and it took 40 years to see it lifted. With the emerging popularity of "Le Snow Scoot" in France, each year sees more resorts granting access to other brands of skibike too. At most resorts you won't be allowed to use drag lifts, but most chairlifts and cable cars are fine. It is highly likely that you will be required to wear a safety leash whilst using a chairlift, to avoid any possibility of dropping your skibike onto the pistes below. You are not normally required to wear the leash whilst skibike riding, nor is it recommended. (When you crash, you are likely to travel far further downhill than your skibike ever will). Now let's take a look at France's skibike friendly resorts. Auron is a pretty village full of charm and is a little gem in the Alpes-Maritimes. It is located just 55 miles from Nice & Monaco. Auron has a 135km of excellent beginners/intermediate slopes and 9 black runs along with plenty of excellent off-piste skiing. Well groomed slopes and supported by an abundance of snow cannons. There are great family facilities including a creche and an excellent adult/childrens ski school. There is good access to slopes at Auron and hardly ever any queues. There is also an excellent bus service from Nice airport direct to the village for just 1 euro. You don't need a car once you are in the resort. In the spring months you can combine it with a visit to the French Rivieira. This region boasts excellent snow conditions and more sunny days than anywhere else in the Alpes. Auron must be on your list of ski resorts to visit. Ax Les Thermes the local hire shop had a SnowScoot outside for hire which bodes well for skibike friendly status, do check first before booking a visit though. 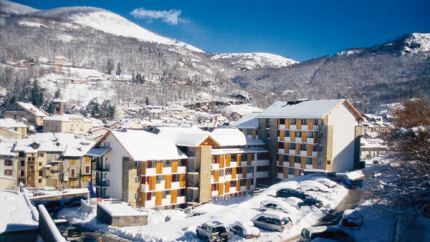 Ax Les Thermes has three ski areas centred around the ancient thermal spa town of Ax in the Eastern Pyrenees close to Andorra. There is skiing for all abilities at Ax Les Thermes and the heights of the resort are between 1400 and 2400m in altitude. There are 75 kms of terrain to explore with 26 groomed trails serviced by 17 lifts (1 gondola, 4 chair lifts and 12 surface lifts). Avoriaz was one of the first resorts in the Portes du Soleil region to offers skibike access. Avoriaz is well known and popular with locals and tourists alike, so expect some overcrowding near the centre and prices to match the quality of the offering at Avoriaz. In recent seasons neighbouring resorts are taking the first steps to follow its lead, study the piste maps carefully and check with the tourist office. Carroz and Flaine a large interlinked domain that is developing into a skibike friendly area to explore with the potential to cover large distances each day. 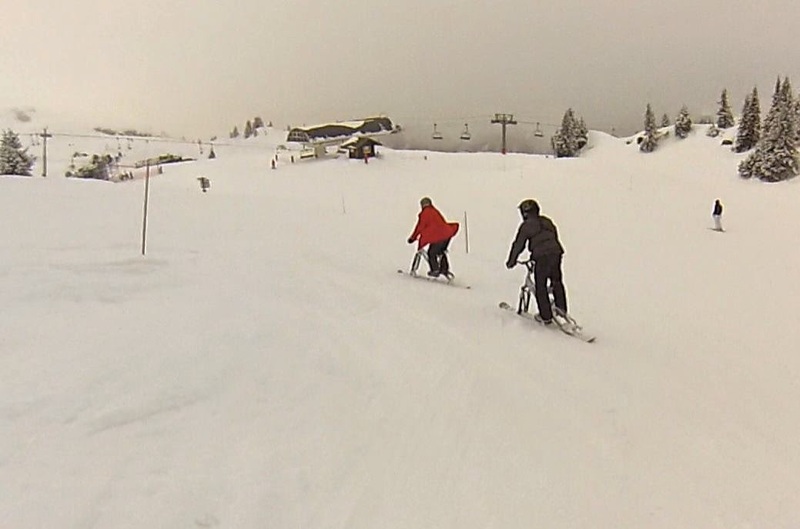 Carroz and Flaine have runs to suit all ability levels including safe areas to try going off piste. The terrain varies from open high peaks, through to sheltered tree line glades. The Crest Voland website depicts a cowboy leaning against a shack smoking a cheroot and there is a definite frontier feel to the place. It has been a Skibob World cup venue and hold a skibob festival due to the presence of active local Brenter Agent, Berod Sports. 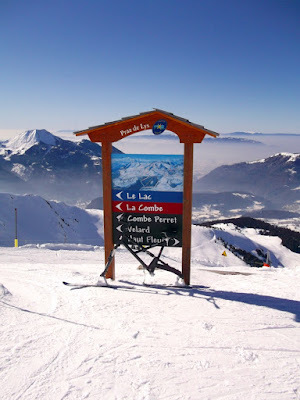 La Dole is part of a disparate group of ski stations loosely marketed and branded as the "Monts Jura". It is skibike friendly at the Les Dappes sector, but the adjacent areas have quite fast, non-detachable chairlifts and for this reason do not currently allow skibikes. La Dole is too small for a weeks vacation, not when there are some full on resorts just over an hour away. 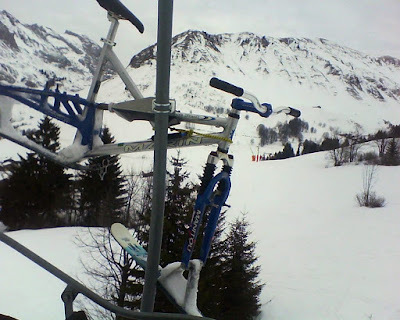 On the other hand, if you are in the area or just passing through and fancy a bit of easy riding, perhaps to loosen up and while away a few hours, it offers cheap and cheerful skibike riding. The price for a midday onwards ski pass at La Dole was under 20€ and could be paid in Swiss Francs too. Is Grand Bornand really Europe's Answer to Durango Mountain Resort? It is a smaller resort but with a very diverse area to explore, with a little careful planning you can enjoy a great deal of the runs available. 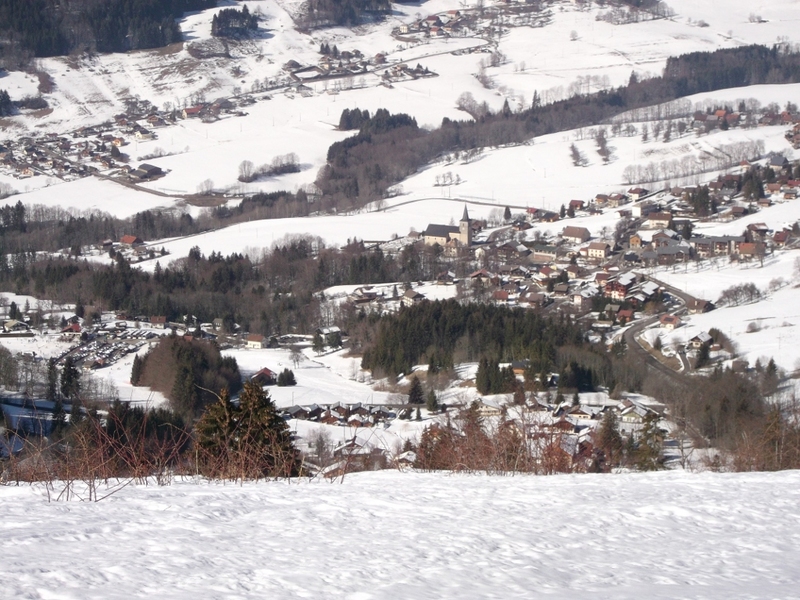 The situation at Grand Bornand is likely to improve in the future, due to the influence of the active and hungry local skibike manufacturer Firem and local skibike hire outlet Reves d'Hiver. Hirmentaz-Les Habères a great little resort a stones throw from the suburbs of Geneva. Having been here for over 3 months & skiing most days, I can safely say it's a wonderful resort. It either snows or it's sunny - fact. It has one of the best snow records of all of France, which I can personally vouch for & often snows more than forecast. The slopes are immaculately groomed & for those that say it's boring & you can ski it in a day - you clearly have never tried the off-piste. As a veteran of Chamonix, Val D'Isere etc, yes, they are bigger but the resort offers some stunning off-piste & tree skiing, easily accessible from the slopes. If you are a beginner, it is fantastic as everything is linked & the slopes are accurately graded - no Val D'Isere 'blues' here!! So you can't really get into trouble. And there are a few cracking little restaurants here too. Also, there are hardly ever any queues on the lifts except at peak holiday times when the main resort return lifts can take you a few minutes to get through. The downside - the accommodation is the pits! No getting away from it. The resort was built in the early 70s so is a concrete carbuncle & most of the hotels/lettings have had little done to them since - dire. Even the better ones are very cheaply finished & poorly maintained/serviced. Don't be fooled by the 4* rating of one hotel either - think that rating must be from the 70s too! Such a shame but it keeps the crowds away!! 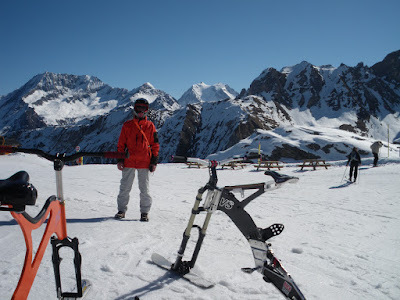 The Massif des Brasses offers fun, cheap, unpretentious skibiking when conditions allow. It is an easy drive from Geneva, almost in the Southern suburbs, you would be unlikely to need chains except during a blizzard or immediately after heavy snow. "Perched above the Baretous Valley, La Pierre-Saint-Martin is the most westerly downhill ski resort in the Pyrenees at a height of 1650m elevation. It proudly boasts magnificent landscapes looking out over the pic d’Anie, the Spanish summits and the Béarn plains. At skibike friendly La Plagne the vertical range is astounding, the highest pistes start at over 3000 metres from which you have the potential to descend down to 1250 metres, that's an astonishing 2000 metres or 6000 feet of vertical range. So perhaps this does put La Plagne on the same level as Chamonix and go some way to amortising the high cosst. It is also a large area, on par with Meribel, plus there are links with Les Arcs and the intermediate resorts. Skiers and snowboarders expect limitless off piste options, open powder filled bowls, massive cliff drops and tight challenging chutes, massive moguls, challenging tree skiing and snowboarding and seemingly endless groomed linking trails and gentle beginner areas. One ski pass allows access to the entire Les 3 Vallees area. It is possible to cover the entire skiing and snowboarding terrain without having to remove your skis or snowboard once except for gondola and cable car access. Spending only one week in Les 3 Vallees would not do the mighty resort justice. Many weeks need to be spent just to scratch the surface of the magnificent terrain. 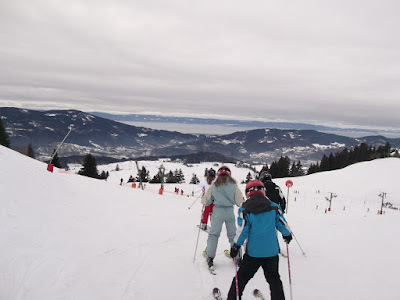 Pras de Lys Sommand has plenty to offer the skibiker, there are runs of varying grades from moderate to very difficult. It is great value, an afternoon lift pass costing just 18.5€, something like £15, which in the UK would buy you an hour on a badly maintained dry slope or roughly 30 minutes in an indoor snow centre. There are plenty of chairlifts, although you do need to check the map, as I spotted one that took you to a piste leading down to a drag lift for the return uphill leg. Access from Geneva to Pras de Lys Sommand by car is on par with the other local resorts such as the Portes du Soleil and the Grand Massif, there is also a coach service from nearby Cluses. 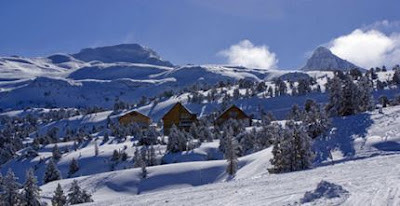 Combined with the neighbouring resort of Vars, Risoul offers almost 180 km of piste that should keep most people happy. The two resorts make the La Foret Blanche ski area. The resort is more low-key than many of the Alpine resorts but it should not be overlooked. Risoul boasts a good snow record and the off-piste opportunities are plentiful. Experts may look at the piste map and be disheartened but there are plenty of steep runs out there that are unmarked. This just sums up the understated nature of the Risoul. One possible criticism is the relatively slow lift network. However, this is being upgraded over time.